Toy 4: Hand Fidgetz Spinners. 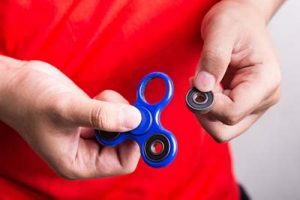 Fidget spinners have been wildly popular in 2017. But W.A.T.C.H. reminds consumers that they are novelty items, not toys for children. The Consumer Product Safety Commission (CPSC) has already investigated several reports of children swallowing the small circle pieces this year. These particular spinners by Kipp Brothers are sold at Walmart, Kippbrothers.com and Bulktoystore.com. They carry no age recommendations. Other models on the market may come with age recommendations. Learning Express Toys sells them and recommends them for consumers age 12 and up. But buyer still beware on this one. No one needs a fidget spinner. Toy 5: Spider-Man Spider Drone Official Movie Edition. Drones continue to be a favorite gift. This one sells for $89.99 and is recommended for children 12 and older. But let the warnings on the box serve as a reminder: children are too young and small to operate a large drone with high-speed rotating blades. Children can injure a finger or suffer a serious laceration. If you have ever tried to use a drone, you know it takes most adults many hours of practice to use it safely. This is a gift to avoid for children. Read the rest of the “10 Worst Toys of 2017” report. Another resource is the “Trouble in Toyland” report, which also highlighted fidget spinners and toys which included balloons. Look for age recommendations. The Consumer Product Safety Commission (CPSC) requires toys to carry age recommendations. This is the best place to start when you consider buying a toy. Avoid small parts. We cannot stress this enough. If you buy a toy, look at the age recommendation. Also do a mental inventory of the small parts and look carefully. Even stuffed animals can have small parts. Ask yourself if a young child – or siblings who live in the same house – could choke on it. Beware when shopping online. Amazon, Craigslist and Ebay have been known to sell products with misleading photos. Read product descriptions and reviews before you buy. If you do buy online, open the toy when it arrives and carefully inspect it. If it is not what you expected, return it and report it to the website. Check for recalled products. A product should be removed from store shelves after a recall. Consumers should get a refund or a repair kit. Then everyone should move on. The reality is a recalled toy or product can be hard to remove from circulation. Do a Google search and visit www.cpsc.gov to check for product recalls. Product Registration for Toys and Children’s Products. We encourage families to fill out the product registration for toys and children’s products, such as strollers, car seats, cribs and furniture. Parents can easily register online to stay informed about safety recalls. The Boston personal injury lawyers of Breakstone, White & Gluck have over 100 years combined experience representing clients who have been injured by defective products. Please carefully select any toys you buy this holiday season and throughout the year. If you have been injured and wish to speak to an attorney, contact us at 800-379-1244 or 617-723-7676 or use our contact form.